Thom Barrett presents up to 15 minutes of illustrated stand up comedy. 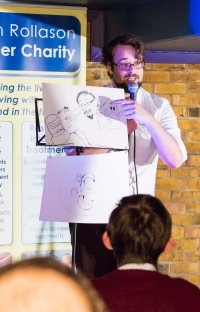 Thom recently won his heat of The Colchester Comedian of the Year by a landslide and earned a mention as 'original' at the Chelmsford Comedian of the year 2014. Thom has been performing comedy for the past two years. Highlights of his work include; accidentally throwing a pork sausage at a vegan, intentionally throwing a vegetarian scotch egg at a drunken Scottish man, dodging the vegetarian scotch egg thrown back at him and introducing a bell to the world of one liners.